Here is a picture of Matt and I with some of our friends. The six of us went to another friends' 10 year Wedding Vow Renewal. (All of these couples are in our playdate group and go to our church.) 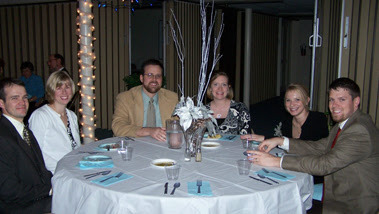 The Vow Renewal was very nice and we all had a great time at the reception. Our dinner conversations varied from our children (of course), to going crabbing, TV shows, to the odd behavior of dolphins =) We are blessed and lucky to know these people and hope that in the years to come we will continue to stay close and create many more memories together. (Kate, thanks for organizing our Playdate Dinner...we had a blast...pictures from that to come soon). (From left to right: Roger and Kate, Matt and Melissa, and Kaelin and Eddie).